Previously we named intervals using the numeric portion of their names, and we introduced scientific pitch notation. Now we’re going to finish the job by using the full designation of each interval. To make sense of what follows, you’ll need to know a bit about sharps and flats as well. We considered intervals that start on C4 (middle C) and end on some white key. It so happens that if you play notes going up the white keys starting with C4 and ending up at C5, you are playing a major scale. You can imagine someone trying to name the intervals saying, “These are the intervals in a major scale, so I’ll call them ‘major’ intervals.” Actually, they’re not, so let’s for now call them “near-major” intervals. When you invert the near-major intervals, most of them end up with different sizes than their non-inverted number-mates as measured in half steps. (The table below clarifies this.) If they miss, they always end up on the low side. In the previous article we showed a diagram with two stretched keyboards back-to-back (which appears later in this article too) and explained why this happens. 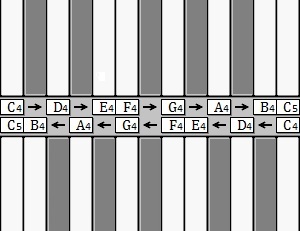 For an example, look at the near-major third C4-to-E4 in the left-hand column; its size is 4 half steps. The corresponding near-minor third in the right-hand column, A4-to-C5, has only 3 half steps. So the near-minor third is smaller than the near-major third. You’ll find that all of the near-minor intervals are either the same or one half step smaller than the near-major intervals with the same numerical designation. Since most of the inverted intervals are in the minor scale and they’re smaller than the major intervals, the name “minor” seems appropriate, more or less. Now our interval namer hits a glitch. There are four near-major intervals that match other near-major intervals in size when you invert them. They’re the unisons, fourths, fifths, and octaves (you can see this in the table above, or see the previous article if you want to know why). It would have been a convenient rule to just say the major scale has all major intervals and the inverted near-minor scale has all minor intervals, but four of the intervals are in both scales. It wouldn’t make any sense, for example, to have a major fourth and a minor fourth actually be the same size. If you saw the interval outside of a scale, how would you know what to call it? Actually, based on the musical context, someone probably could have invented a method of determining the appropriate name for these intervals, but fortunately another solution was chosen. Intervals of a unison, fourth, fifth, or octave that occur in the major scale are called “perfect” because, well, they’re just that good. And when you invert a perfect interval, the result is still a perfect interval. For this next bit we need to introduce some sharps and flats. Let’s start with a major third, C4 to E4. The table tells us that this is four half steps in size. Now let’s flat the E, so the interval becomes C4 to Eb4. Since flatting lowers the E by a half step, this new interval must be three half steps in size. But notice that in the table, we already have a third that is three half steps in size, namely A4 to C5, and it’s a minor third. So C4 to Eb4 is a minor third as well. We could do the same thing with the other major intervals, and we’d find that C4 to Db4, C4 to Ab4, and C4 to Bb4 are all minor intervals. None of the above applies to the perfect intervals. If you flatted the top note of a perfect interval, the result doesn’t match any interval in the table. For example, C4 to Gb4 is a fifth with six half steps, and all of the fifths in the table are perfect fifths with seven half steps, so the above technique can’t help us. In the next section we’ll define what this interval is called. What if you go one step further? We flatted the top note of a major third and ended up with a minor third. What if you flat the top note yet again? In the example we used above, C4 to E4 was a major third, C4 to Eb4 was a minor third, but what is C4 to E-double-flat-4? It turns out that the interval C4 to Ebb4 is called a diminished third. This makes sense because “diminished” sounds like it would refer to an interval that was made smaller. Similarly the other minor intervals can all be reduced by a half step to give diminished intervals. There is an important point to be careful of here. The numeric designation only refers to letter names, not considering sharps and flats. One might be tempted to say that since Ebb is the same note as D, that the interval C4 to Ebb4 ought to be the same interval as C4 to D4. But this would be wrong. It is the same size in half steps, but it is not the same interval. So for the technically nitpicky types, if someone plays C4 and D4 on the piano and asks you what interval they’re playing, the strictly correct answer would be, “I don’t know.” For all you know they could be “actually” playing Ebb4. Actually, though, you’d come across as quite the dork if you said “I don’t know” and tried to use this justification. You could instead choose the erudite path and say, “it’s a major second or a diminished third.” Now the questioner will be impressed by your sophisticated musical knowledge. But you can go the other way also. What if you raise the top note of a major interval? What kind of a third is C4 to E-sharp-4? It happens that it’s called an “augmented” third, which makes sense because “augmented” sounds like an interval that was made larger.